A recessed cabinet takes up virtually no space at all. Because it's built directly into the wall between the wall studs, a recessed cabinet does not add to the clutter of your room. In fact, it will provide you with a simple storage solution relatively easy to construct. By building your own recessed cabinet, you can not only save yourself the cost of buying another piece of furniture, but you can also customize it to suit your need and replicate it in other rooms of your house. Building a recessed cabinet between wall studs means that you won't use up valuable floor space. Use a stud finder to locate the studs in the wall where you intend to install your recessed cabinets. Mark the position of the studs on the wall in pencil. Check the blueprints of your house to ensure no pipes are running through the wall between the studs you choose. Use a straight edge to trace a rectangular shape on the wall, using the inside edges of the sides as the sides of the rectangle. The distance between the top and bottom of the rectangle should be equal to the desired height of your cabinet. Cut out the rectangle shape you just drew, using a drywall saw. Use caution when sawing through the drywall to avoid cutting into the wall studs. Set the cut-out piece of drywall aside when finished. Use a circular saw to cut a sheet of 1/4-inch plywood to the width and height of the space between the studs. Set this sheet of plywood upright inside the space to serve as the back panel for your cabinet. Attach the plywood by driving nails from a nail gun through the plywood into the wall along all four edges. Construct the top, bottom and side panels for your cabinet by cutting them out of 1/2-inch plywood with the circular saw. Cut the top and bottom panels to the width and depth measurements of the space. For the side panels, use the depth measurement and the height measurement, minus 1 inch to accommodate the thickness of the top and bottom panels. Install the top panel by sliding it horizontally between the wall studs at the top of the space designated for the recessed cabinet. Attach the top panel by driving nails from the nail gun through the edges of the panel at an angle into the wall studs and the back panel. Install the bottom panel along the bottom of the designated space in a similar manner. Slide the side panels vertically into the cutout space, sandwiching them between the ends of the top and bottom panels. The widest edge of each side panel should be flush with the adjacent wall stud. Secure the panels in place by driving nails from the nail gun through the panels into the studs, as well as the top, bottom and back panels. Cut any shelves you intend to install inside your cabinet using the depth measurement of the cabinet and the width measurement, minus 1 inch. Slide the shelves horizontally between the side panels at the desired interval. Drive nails from the nail gun at a downward angle through the shelves into the side and back panels. Build the door for your cabinet by cutting a sheet of 1/2-inch plywood to the total width and height dimensions of the cabinet. Install two metal hinges along one edge of the door, positioning each one about 2 inches from each corner, and screw the other side of the hinges into the cabinet frame. Screw a metal knob or handle onto the cabinet front. Paint or stain your recessed cabinet as you desire to match the existing decor scheme in your room. If you want your cabinet to function as a kind of hidden storage, paint the cabinet door the same color as the wall where you installed it. 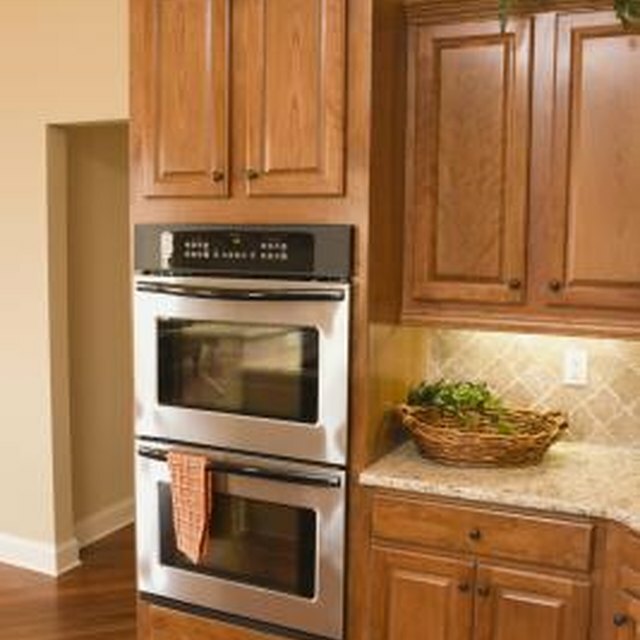 You may further customize the front of your cabinet by installing a border of decorative wood trim on the face of the door frame. To attach the trim, apply a bead of wood glue, then use nails from the nail gun to secure it in place. Always wear safety gear and exercise caution when operating power tools like the circular saw and nail gun.